`I can get a new brother? On the internet?' Jonny muttered. `Oh sweet mangoes of heaven!' Everyone has dreamed of being able to get rid of their brother or sister at one time or another - but for Jonny, the dream is about to become a reality with SiblingSwap.com! What could be better than someone awesome to replace Ted, Jonny's obnoxious older brother. But finding the perfect brother isn't easy, as Jonny discovers when Sibling Swap sends him a line of increasingly bizarre replacements: first a merboy, then a brother raised by meerkats, and then the ghost of Henry the Eighth! What's coming next?! Suddenly old Ted isn't looking so bad. But can Jonny ever get him back? 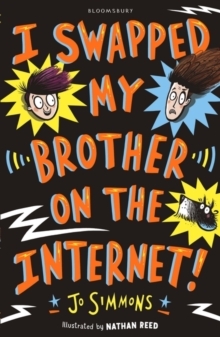 A hilarious tale of wish fulfilment gone wrong that every child will relate to - perfect for fans of Pamela Butchart, My Brother is a Superhero and David Baddiel's The Parent Agency.